The following site contains items that Geeks Fish Too endorses. We believe that the items listed are good items and we either use them personally or we wish we did! Any purchase made at our Amazon store helps keep me fishing and providing stories to you. 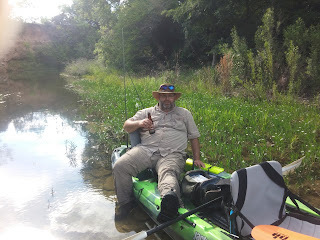 Fishing costs money and by ordering your Amazon stuff here you help sponsor my ability to fish without costing YOU one cent extra. Amazon pays me a percentage of the purchase simply because you made the purchase through my site! If you're skeptical, search directly through Amazon and then search through my "Whole store" link below. Shop ALL of Amazon with one link! The items listed on this page are items that I personally use or wish I could use. I will be adding more and more links here as I mention items in my blog articles. The Booyah Pond Magic spinner and buzz baits are phenomenal additions to your tackle box. - The spinner baits hold up very well even in Texas rivers where they often land on a rocky shore before jumping into the water. - The 1/8oz buzz baits have caught me fish up to 3lbs in size and are perfect for Guadeloupe Bass. My personal favorite colors are White and Purple. The Shimano Curado series is an AWESOME reel. I've had mine for several years, have used it in Saltwater as well. Simply spray with Reel Magic once in a while to keep the corrosion away and you'll get many years of use out of it like I have! Reel Magic is great for all of your reels! I even spray it into my lure boxes (lightly) to put a coat of oil on my hooks so they don't rust. The Shimano Sahara is an awesome spinning reel. If I had it to do again I'd get a smaller size than the 2500 mode that I got. I think it's tad too large. The 1000 should work fine for lighter fishing rods. Still, the 2500 matched up on my heavy spinning rod beautifully and makes 75-100 yard casts with a Zara Spook. The Shimano Sienna is a nice light reel that I have used in the past and still have around as a backup. It works great but as indicated by the price, it doesn't last as long as the other models. Still, it makes a great reel if you are needing something cheap and good. The Pflueger Presedent is my go to model for a small reel. I've been using the tiniest on my ultralight and it works well. The only issue I have with it is when I catch a 3lb bass - it tends to overwhelm the reel. But even then when I hold the spool to pull a fish the bail handles it without issue. Here are the paddles that Sarah and I use. The BB paddle is great for small hands and is super light - I like this paddle so much I may switch to it. The Aqua Bound paddle is nice for larger hands. Remember you want a longer paddle, not a shorter one. Longer is better for wide kayaks. While I personally own a Jackson Big Tuna (not found on Amazon), here are some Kayak's we'd love to own. Feel Free makes some very nice kayaks! The seat on the 11.5 is supposed to be very comfortable. The prices on Amazon are actually pretty good too!